Josh Bowers was left stranded on 99 not out for Wisbech against Godmanchester. Godmanchester wrested control of Cambs Division One after beating previous leaders Wisbech by two wickets with three balls to spare at Harecroft Road yesterday (July 25). Josh Bowers finished unbeaten, and stranded, on 99 as Wisbech reached 217-7 in their 48 overs, but the visitors sneaked home after overcoming an early burst of wickets from Sam Rippington (4-38). Godmanchester lost half their wickets for just 106, but Byron Overstone (84) engineered a match-winning recovery to take his side seven points clear at the top. James Williams (50) also batted well for Wisbech. Third-placed Ramsey were without a fixture, but fourth-placed Nassington proved 76 runs too good for Ketton. 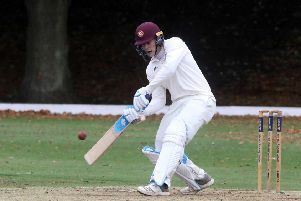 The Lions became the latest side to find batting at Nassington a trick proposition and they slumped to 96 all out as spinners Harrison Craig (3-23) and Kasim Ikhlaq (3-26) took advantage of favourable conditions. Unsurprisingly South African spinner Ulrich Van Duyker (4-43) also found useful turn for Ketton, but a fifth-wicket stand of 63 between Dan Robinson (65) and Conor Craig (33) took the game out of Ketton’s reach. Van Duyker (26) also top scored for his side. March are showing the sort of fight necessary to win their relegation battle. They recovered from 33-5 to reach 156 against Waresley and then restricted their visitors to 146-8 in reply. Waresley had six more overs to bat than their hosts, but after an opening stand of 40, they found Ash Vodnala (3-16) hard to get away. Khalsa slumped to the bottom of Division Two after losing at previous basement-dwellers Sawston & Babraham by seven wickets. Khalsa were dismissed for just 115. Newborough remain in the top half after seeing off Abington by six wickets. Vamshi Parvathaneni (4-25) and Ashley Fisher (2-39) did most to hustle Abington out for 164 before Ross Harris (67no) and Greg Rowland took charge with the bat..
March 156 (J. Betts 28, T. Phillips 24, J. Fox 20, Z. Ringrose 4-30, R. Craze 4-31). Waresley 146-8 (R. Craze 30, T. Griffiths 29, A. Vodnala 3-16, T. Phillips 2-26, C. Young 2-33). Nassington 174 (D. Robinson 65, C. Craig 34, J. Pope 26, U. Van Duyker 4-43, S. Mahmood 3-31, R. Woolley 2-39). Ketton 96 (U. Van Duyker 26, H. Craig 3-23, K. Ikhlaq 3-26, R. Duffy 2-16). Wisbech 217-7 (J. Bowers 99no, J. Williams 50, D. Haynes 33, K. Adhav 2-34). Abington 164 (V. Parvathaneni 4-25, A. Fisher 3-39). Newborough 165-4 (R. Harris 67no, G. Rowland 50).